South Philadelphia is best known for being the area where cheese steaks originated. What most people don't know is that nestled within the old brick facades are many hidden dining gems. Take for example Oregon Express...unless you are from the surrounding neighborhood you would probably not even notice this small store front. And what a pity that is as they serve some yummy food; their specialty being breakfast. There is nothing fancy about Oregon Express. Space is limited and most of their business is takeout. But for those that want to sit back and enjoy the rotating clientele there are 4 indoor tables and 2 out. The food is all made to order in the tiny kitchen off to the side and you can expect it to be good. Sandwiches come in two sizes and are very inexpensive. Coffee is fixed for you per your request and amazingly it comes out great every time. When I'm in the city you can pretty much guarantee I will have a least one breakfast at Oregon Express. 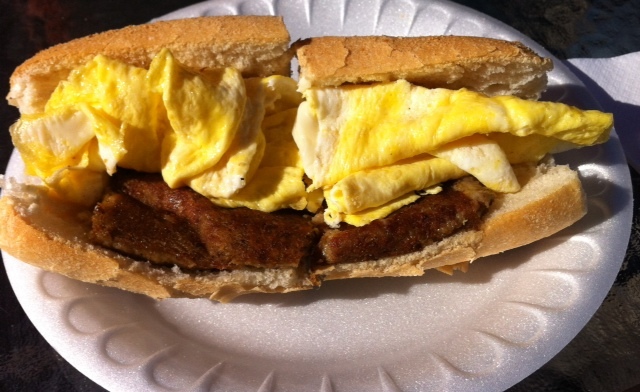 My favorite sandwich (shown above) Eggs, Cheese & Scrapple. Yes, I'm a scrapple lover...but that's for another post. Mm that looks so yum!